With all the rain we’ve been having in the Midwest, I woke Saturday morning to discover a basement with an excessively undesirable amount of water on the floor. The silver lining was my lady Jessica moved every stick of my hardwoods out of harm’s way before she even bothered to wake me to tell me about it. That’s a good girl, right there. We then proceeded to call the landlord who rushed over with a REAL shop-vac and an air mover. He helped us clean up the mess and dispose of a lot of ruined cardboard. Thankfully I had enough sawdust on the floor to prevent any real damage to tools or materials, that and Jess taking the initiative to protect Renk Guitars investment. I can’t thank her enough. Before that, I had a mishap involving a drill and the Raze prototype’s fretboard. I was talking on the phone whilst drilling out my neck screw holes for a #8 neck screw. Thought I had set an appropriate depth indicator, but I totally forgot to take into account the depth of the scallops. Bit went right through. I patched it and will patch it again, because it turned out a bit lighter than the rest of the board. Good thing she’s just a prototype. This weekend wasn’t entirely a bust. I did get the chance to visit #industries and play through a couple Scarlett Amplifiers, the Screamer 70 and Screamer 30 models. Let me tell you, they are appropriately named. I did also get the Raze model prototype in playing shape, and I wired my Black Water Guitar Company Elder God bridge pickup direct to an output jack just to hear the sound of her. She’s going to be an amazing guitar once I dial her in. I’ll be massaging templates to address some placement issues, mainly upper fret access, but once those are done I think I’ll be doing a rebuild in claro walnut. That’s what this model is ultimately begging for. 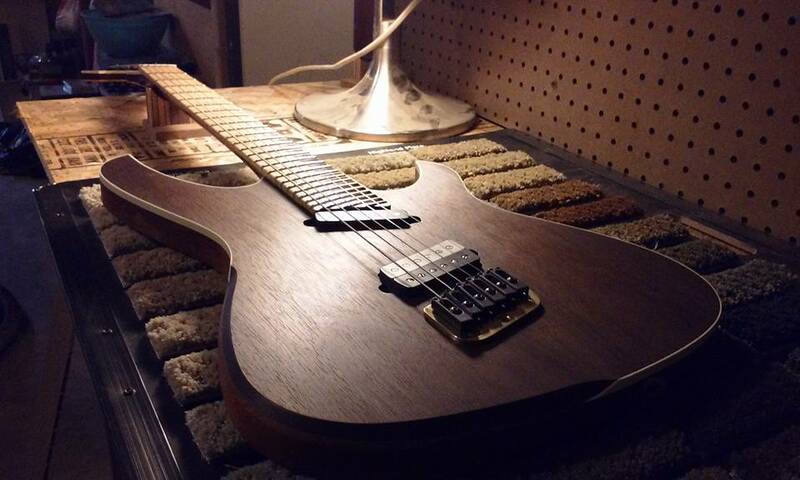 Claro walnut top with a maple fretboard. Here’s after I assembled her. I also took the opportunity to build a new assembly workbench away from all my dusty power tools. It’s at a standing height, so I won’t get a crick in the back hunching over my woodworking bench. It was also time to segregate rough construction workspace from assembly and repair workspace to prevent scratches and dings in my finished guitars. Welcome to Renkguitars.com and stay tuned for more updates! You think water moves fast? You should see ice. It moves like it has a mind. Like it knows it killed the world once and got a taste for murder. After the avalanche, it took us a week to climb out. Now, I don’t know exactly when we turned on each other, but I know that seven of us survived the slide… and only five made it out. Now we took an oath, that I’m breaking now. We said we’d say it was the snow that killed the other two, but it wasn’t. Renk is a father, musician, artist, and luthier. © 2019 Renk Guitars. All Rights Reserved.